In the first half of the nineteenth century, Southern Africa was a jumble of British colonies, Boer republics and African chiefdoms, a troublesome region of little interest to the outside world. 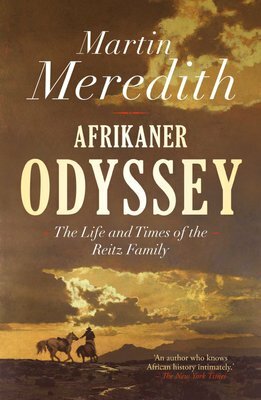 Into this frontier world came the Reitz family, Afrikaner gentry from the Cape, who settled in Bloemfontein and played a key role in the building of the Orange Free State. Frank Reitz, successively chief justice and modernising president of the young republic, went on to serve as State Secretary of the Transvaal Republic. In 1899, he stood shoulder to shoulder with President Paul Kruger to resist Britain’s war of conquest in Southern Africa. At the heart of this tale is the extraordinary life of Deneys Reitz, third son of Frank Reitz and Bianca Thesen. The young Reitz’s account of his adventures in the field during the Anglo-Boer War (1899–1902), published as Commando, became a classic of irregular warfare. After a period of exile in Madagascar, he went on become one of South Africa’s most distinguished lawyers, statesmen and soldiers. Martin Meredith interweaves Reitz’s experiences, taken from his unpublished notebooks, with the wider story of Britain’s brutal suppression of Boer resistance. Concise and readable, Afrikaner Odyssey is a wide-ranging portrait of an aristocratic Afrikaner family whose achievements run like fine thread through these turbulent times, and whose presence is still marked on the South African landscape.